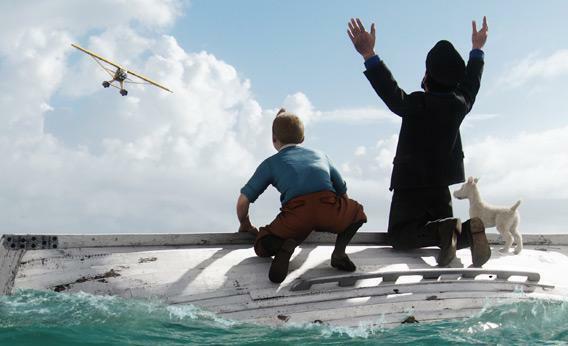 Adventures of Tintin review: Spielberg’s motion-capture adventure has its charms, but it’s no Raiders. Steven Spielberg’s motion-capture adventure has its charms, but it’s no Raiders. © 2010 DW Studios L.L.C. All rights reserved. Also in Slate, Sam Adams reviews two biographies of Hergé. For his first animated feature and his first foray into the waters of 3-D, Steven Spielberg, that most American of filmmakers, has chosen to adapt a distinctly un-American property. 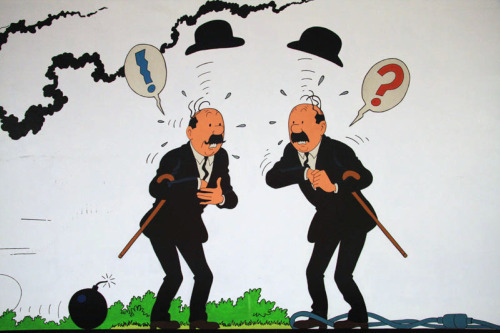 The classic Hergé comic The Adventures of Tintin has been translated into more than 50 languages since its first appearance in a Belgian newspaper in 1929. In this country, however, it remains a cult item for comic aficionados. Spielberg has said that he first discovered Tintin after the release of Raiders of the Lost Ark in 1981, when someone told him the retro-styled heroics of Indiana Jones reminded them of the Belgian comic. The director’s bold, if not always successful, gambit here is to yank the orange-haired boy reporter out of the 20th century and into the 21st, replacing Hergé’s bright, clean line drawings with the latest in performance-capture technology. Was The Adventures of Tintin a movie that I personally vibed with? Not really. It felt overstuffed and busy, its charm a little calculated, its outsized budget (reputed to be upward of $130 million) a tad too ostentatiously on display. But it’s a rollicking yarn told with scads of invention and energy, not to mention a technical marvel of the first order. The film’s motion-capture know-how comes courtesy of producer Peter Jackson, the Lord of the Rings director whose Weta studio provided the post-production digital effects. This technique has come a long way since Robert Zemeckis freaked out audiences with The Polar Express, whose motion-captured characters had a doll-eyed, automaton-like quality that repelled audiences. Even the non-Tintin characters can be a little unsettling at first, these hyper-real living cartoons with their out-of-proportion heads and liquid eyes. But once you grow to accept them as inhabitants of the movie’s candy-colored pseudo-world, they’re expressive, even endearing. If there’s no one on screen who approaches the complexity of Caesar, Andy Serkis’ motion-captured chimp protagonist in Rise of the Planet of the Apes, it’s the fault of the film’s frantically action-packed pacing, not the animation technique. The film’s story combines elements from the plotlines of three different Tintin comics, principally 1943’s The Secret of the Unicorn. After Tintin (Jamie Bell) buys a model ship at a flea market, he’s kidnapped by the evil Sakharine (Daniel Craig), who’s searching for a map that will lead him to a sunken treasure. Tintin escapes, along with his faithful pup Snowy, and teams up with the perpetually drunken sea-salt Captain Haddock (motion-capture stalwart Serkis) to beat Sakharine to the ancient shipwreck. Along the way they’ll be stranded at sea in a burning lifeboat, crash-land a plane in the Sahara Desert, and engage in a manic chase through a terraced Middle Eastern city, a tour-de-force action sequence that Spielberg films in a single unbroken shot (if the words “film” and “shot” have any meaning in the context of all-digital animation). “Performance” is another word that’s thrown into question by new animation technologies. Rather than just lending their voices, the likes of Bell and Craig literally embody their character, providing, in essence, a moving skeleton that’s then “clad” in digital flesh. I’m inclined to say there isn’t an actor in Tintin who gives a less than terrific “performance,” but given how many other artists it required to create each character, it seems somehow wrong to give all the credit (or blame) to an individual performer. Still, it’s worth noting that Serkis, as the drunken, self-pitying Scotsman Haddock, is a standout. It’s a strange, dark role—so dark it nearly takes the PG-rated Tintin into not-fit-for-children territory—and Serkis plays it as big and broad as a barn—a very sincere barn. There’s no hip remove between him and the character, no sense of condescension to the role. Maybe it’s Serkis’ familiarity with acting in a motion-capture suit (in addition to Caesar the ape, he’s also played Gollum and King Kong), but Haddock, for all his cartoonish bluster, feels more like a living presence than anyone else onscreen. There are some witty fillips in the script, which was co-authored by three British writers high on the comedy food chain: TV writer and producer Steven Moffat (Dr. Who, Coupling) and the writer/directors Edgar Wright and Joe Cornish (Shaun of the Dead, Attack the Block). Simon Pegg and Nick Frost are amusing as Thomson and Thompson, two near-identical detectives cheerily oblivious to their own incompetence. And by moments, the laws-of-physics-violating possibilities opened up by motion capture make for imaginative sight gags that would have been impossible with flesh-and-blood stuntmen—for instance, a group of sleeping sailors sliding wildly from one bunk to another as the ship pitches in the water, snoring all the while. But Tintin suffers from a fundamental pacing problem. In essence, it’s an unbroken 107-minute chase, with very little down time to explore the nuances of character or story. Even Indiana Jones took time out once in a while to teach an archeology class or sweet-talk a lady friend. Is it possible that the eternally boyish Spielberg is so thrilled by these new digital toys that he’s neglecting his usually impeccable sense for the beats of classic Hollywood storytelling? Tintin fans who are open to a technologically sophisticated but still sweetly nostalgic reworking of their beloved comic will likely respond well to The Adventures of Tintin, as will children between the ages of, I’d say, 8 and 12 (though the frank ongoing subplot about Captain Haddock’s drinking problem may require some parental pussyfooting—this is a man who, in a pinch, downs a bottle of medicinal alcohol from a first-aid kit). Even if this hyperactive movie isn’t your cup of tea, there’s much to admire on-screen, including Spielberg’s astonishing attention to visual detail and John Williams’ jaunty score (which evokes the Raiders theme without ever becoming quite that whistle-able.) Like Martin Scorsese’s Hugo, The Adventures of Tintin is clearly a labor of love on the part of the filmmaker, even if the result feels more labored than lovable.